This diorama provides a visual re-creation of Weybourne Camp, Norfolk [Now the Muckleburgh Collection – http://www.muckleburgh.co.uk ] as it would have appeared during the Second World War. It is now on display at the collection, and is used to illustrate to visitors part of the history of the site. As space limitations did not permit a full re-creation of the whole site area the diorama was structured to visually convey the important activities which took place there in a reasonably authentic setting at a visually appreciable scale [1/76th]. A visitor to the collection is first presented with views of the entrance area to the camp along with a vehicle park [MT or ‘Motor Transport’ parking area]. Differing types of lorry in use at the time are shown – Bedford, AEC, Thornycroft and Leyland. There is also an Austin YMCA mobile canteen providing refreshments for a group of troops taking a break from unloading and preparing materials for the ongoing construction works which took place on site during the wartime period. The collection of buildings includes a Medical Centre, and a Water Tower for fresh water supply is also visible. Outside the Medical there are parked Austin ‘K2’ Ambulances. Overhead cabling providing power and telephone connections between the various camp buildings are included. The differing types of anti-aircraft guns in training use can be seen along a cliff top. There are also circular ‘Bell’ Tents. These were used to house many of the troops under training as the camp gradually expanded. In wintertime Weybourne was known as one of the worst postings in Britain… if you were unlucky enough to be billeted in a Bell tent…! The diorama includes a ‘Mess’ or Canteen, with a group of Gunners outside, unloading provisions and peeling potatoes from sacks… there is also a central parade ground filled with vehicles and troops with more Bedford and Leyland trucks with a very useful Austin ‘Tilly’ [Utility Car] passing more BSA motor cycles parked along the main road though the camp. There is also a strange catapult device for launching aircraft, complete with a number of ‘staff’ cars parked nearby. The catapult is being inspected by a group of ‘V.I.P.’s’. There are also fixed anti-aircraft guns housed in permanent concrete embrasures overlooking the cliffs. The Gunners are standing to attention, awaiting inspection by the V.I.P’s. Along the clifftop there are a number of anti- aircraft guns either in use or being deployed for firing practice. Above is a silver-painted ‘Queen Bee’ target aircraft flying along the cliff top as a target. There are 40mm ‘Bofors’ light anti-aircraft guns. These guns are rapid-fire small-calibre weapons intended for low-level defence – ideal for shooting down fast attacking aircraft approaching at altitudes below 1,500ft – a close-defence weapon which saw use by many armies for decades after WW II. These guns are mobile – they are mounted on wheeled carriages towed behind Bedford ‘QLB’ artillery tractors. There are also ‘Heavy’ A-A Guns. Two are housed in permanent concrete structures, whilst others are deployed from mobile platforms towed behind AEC ‘Matador’ prime-mover Lorries. These are all of 3.7in Calibre and are high-velocity weapons capable of firing shells to a great altitude [15,000ft +]. These guns were an equivalent to the much-vaunted German ‘88mm’ A-A Gun and had similar capabilities. The guns were the primary weapons used for city and industry defence, and were sited to provide ‘Ack-Ack’ barrages against attacking bombers flying at higher altitude. There is also a rectangular concrete structure which contains a ‘gun predictor’ stereo gun sight – a range and altitude finder used to feed information to the gunners about the position, speed and height of the attacking planes [similar equipment to gun-sighting equipment fitted to larger warships]. 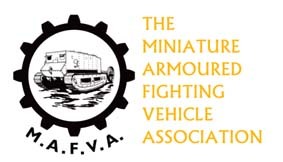 The diorama was created by Members of the Cambridge Branch of M.A.F.V.A. and was installed on site in 2015.